Instead of ordering a sit-down meal of schnitzel under the retractable roof, hit up the grill guy for a fat kielbasa loaded with kraut and steer your brood toward one of the wood tables in the rustic hall. Imaginative youngsters just might believe they’re in Bavaria rather than Brooklyn. On a weekend afternoon, savor any of the Czech and German draft beers, like the Schneider Weisse. You’ll want to leave by early evening, before the bar is infiltrated by revelers chugging mammoth steins. Gutes Bier und eine warme Stimmung. I just moved from Philly which is FULL of awesome beer gardens and now I've finally found one that compares here. Really spacious, inside and outside, live music, TV's for the sports fans. Delicious pretzels, great beer list! What is there to say about Radegast that has not already been said? (by your one friend that moved to Williamsburg two months ago). 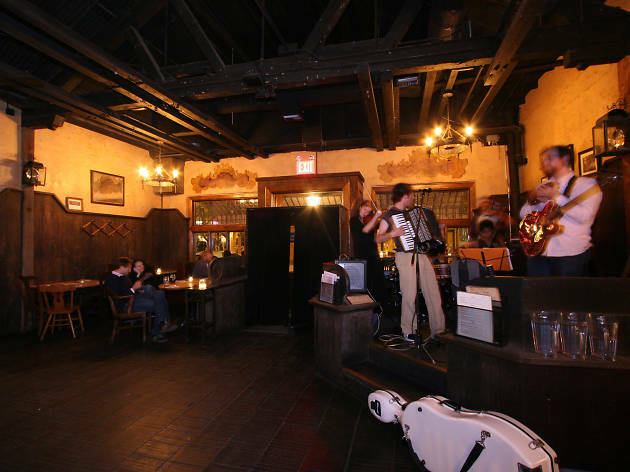 Radegast is among my favorite establishments in the city. I say "establishment" not "bar" because it goes way beyond that. If you've read some of my other reviews, you'll see that I love two things: good beer, and communal seating. This place does both better than almost anywhere, making it the ultimate utility player for any occasion. But the best time to come here is when a) it's Saturday afternoon, b) you're amongst a large group of friends, and c) you're looking for a chill vibe that borders on being a "scene" without ever going full "Standard Biergarten" on you. 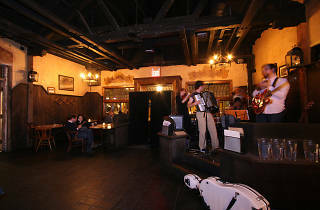 12 months a year you'll find live jazz music here on the weekends, which always sets the mood for a perfect afternoon. Let the music serenade you while you sip from your oversized stein and show down on something from the grill. And while you may be tempted to go for a wurst (which, don't get me wrong, wouldn't be the most ill informed decision you could make), the burger is truly underrated. And if you're one of those "UGH in Brooklyn?? That's so far!" people, rest easy knowing that Radegast is a mere 2 minute walk off the L.
So what I'm saying is, I will continue to go here religiously...but only until 2019. This is a great bar for group outings—it's huge! There are three separate rooms, all with giant picnic-style tables that can fit a bunch of people, and servers will take your order anywhere. There's often German music playing in the front room, and the beers are giant and reasonably priced, plus authentically European. You HAVE to grub on some of the food here, like goulash, veil schniztel, pappardelle, short ribs, and my favorite, the spatzle and scallion potato pancakes. There's also a cool interior with a very pub-like atmosphere and lots of ancient photos and paintings on the walls. Definitely a fun place for Oktoberfest activities or a big 'ol birthday, with plenty of bars to hop on over to afterward.